Happy 4th of July weekend! I'm back from my road trip, and while I'm a bit depressed it flew by so quickly, I'm so grateful for the experience and all that I saw while on the road, and I look forward to planning my next trip. I came back with 650 photos and so much to write about! I could have happily stayed on the road for another month, but due to work obligations, I squeezed in as much as possible in a week. Leaving on this trip was, by far, the best decision I have made in a long time. 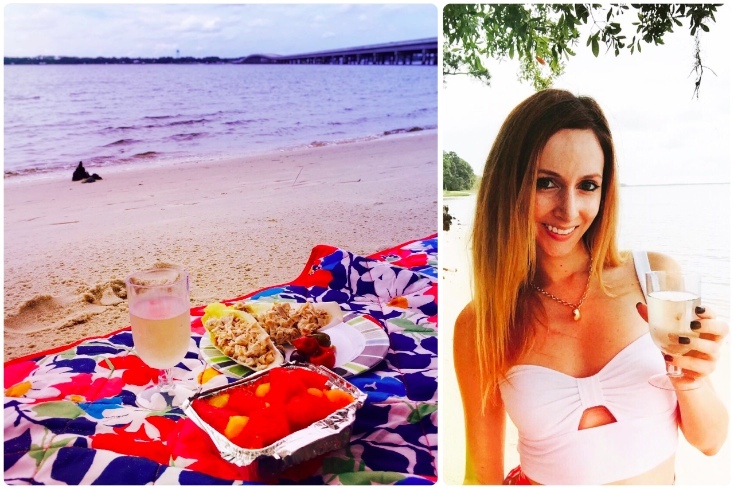 Looking back over the past 3 years, in which I have settled in Florida and only traveled back home to the Northeast, I regret not leaving the state and exploring more of the South sooner. While I have not been gone for very long, I am back a slightly changed, enlightened, and richer person. I learned a lot, met people whom I would never have encountered having not left, ate delicious Southern food, heard live music, and stood in jaw-droppingly beautiful and historic places. It is amazing how hitting the road can forever change your life and inspire you to seek and experience more than you did before. I will say that I spent an enormous amount of time researching and planning out this trip and thoroughly enjoyed all the research that I did. 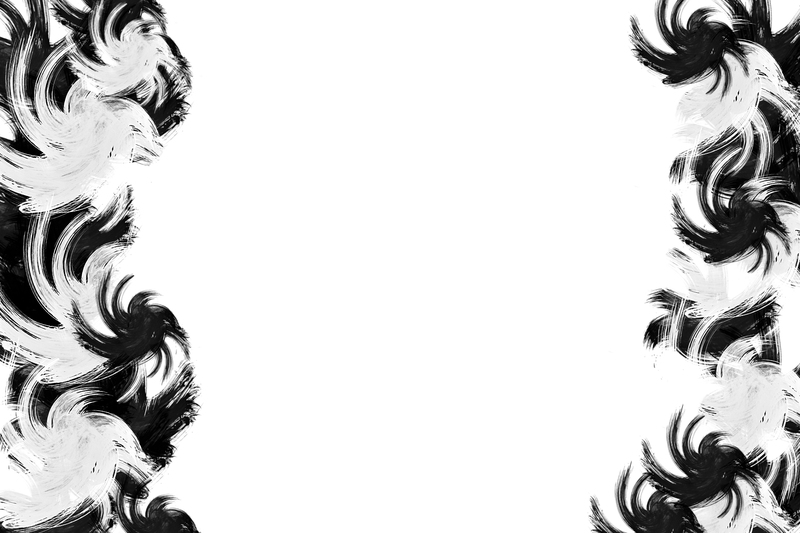 Due to time constraints, this turned out to be crucial. On my next road trip, I will definitely take a little more time off work and split up the driving even more. I found that due to stopping and my obsessive picture-taking habits, my estimated driving times were way off, and it took longer to get from place to place. There were just so many picturesque little stops in between, and I couldn't resist! I was going to embark on this trip alone... I am very independent and have no problem traveling alone. A lot of times, I find it is easier to travel alone due to first, how many photos I take, and second, that I am a very fast-paced person with what can be expensive taste, and I often find it is difficult to coordinate travel with someone with different expectations. In the past, I have ventured off to Mexico by myself and spent many nights by myself in New York City. My mother, learning the details of my trip, offered to come along with me for the ride. She did not know what she was getting herself into! I give her credit for her patience - it certainly was quite a ride! The first leg of my trip was from The Villages, FL to Mobile, AL. This was just under 500 miles. 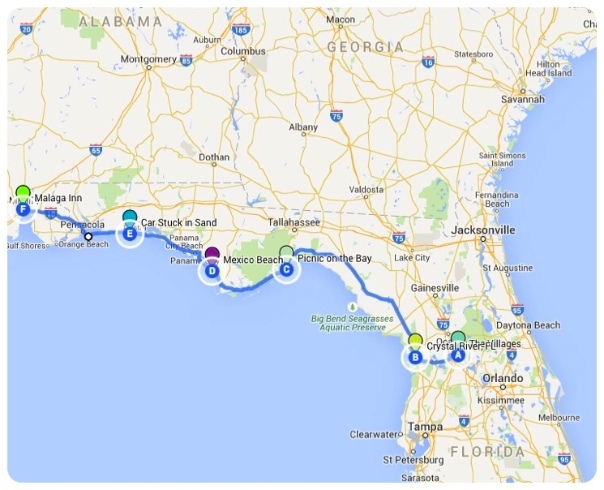 I drove to Crystal River, and from there, took route 19 to the scenic coastal highway, route 98, along the entire Florida panhandle to Pensacola. I had gotten sick a few days before the trip with sinus issues due to the extreme humidity in Florida, so I ended up sleeping in a little having finished work late the night before, and we left around 11am the next morning. The drive took about 12 hours (I have no idea how I estimated 6 to 7 hours) and we missed our scheduled dinner that night in Mobile. 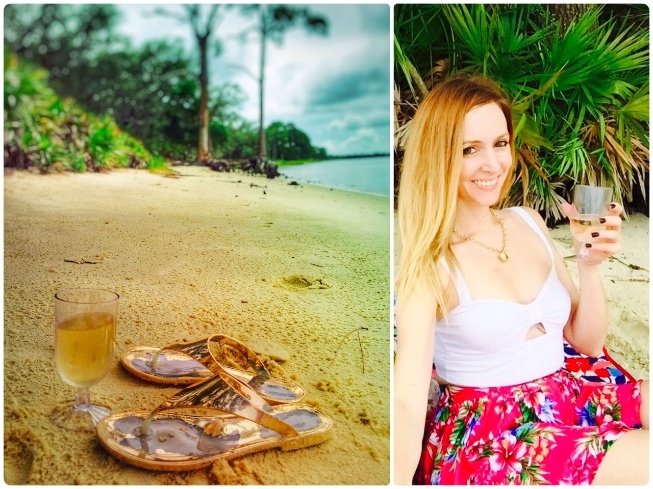 Regardless of missing a fine dining experience, it really was a beautiful leisurely drive, and I saw many places along the coast that I had not seen before. The drive was a bit drab until getting to the start of Route 98, in Perry, FL. Much of route 19 was a road carved out of pinetrees. Being from New England, I loved seeing pines, and the fresh pine scent began wafting in the car as we approached 98. 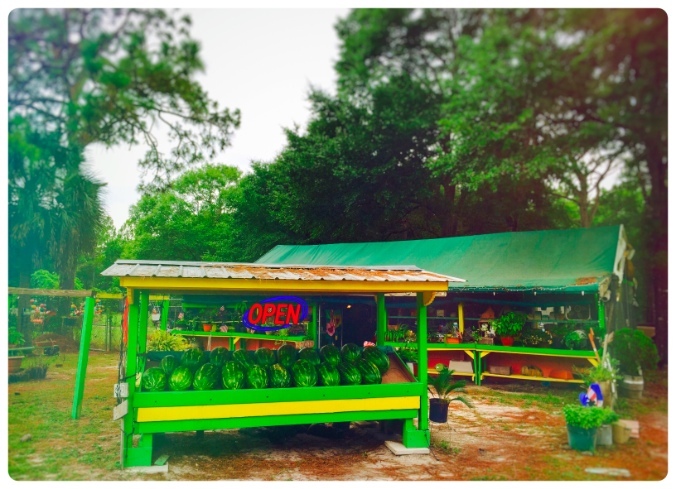 The first time I pulled over, having finally found something picture-worthy, was in Crawfordville, and, yes, across the street from a pork smoker, it was a colorful watermelon stand, with a flashing "open" sign. By the time we reached the watermelon stand, it was nearly 3pm, and we were starving. We were waiting for a place to picnic with a view of the water. 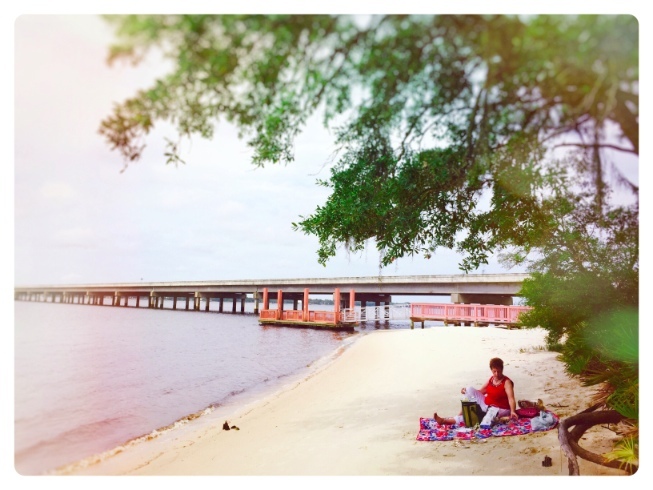 We crossed a bridge over Ochlockenee Bay off of the Gulf of Mexico, and ended up finding a perfect little private beach on the other side of the bay with a shady spot for our picnic blanket, and of course, beautiful scenery. My mom had packed a delicious lunch: rotisserie chicken salad lettuce cups, olives and hot peppers, fresh fruit, and an assortment of cheeses, paired with glasses of pinot grigio, of course! After lunch, we continued driving along the coast on Route 98, stopping further into Panacea for a view of the Gulf of Mexico. 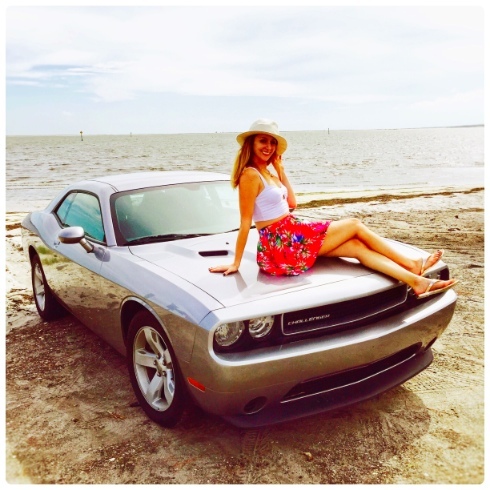 There we found another secluded beach area, perfect for a photo opportunity with my rental Challenger, which was comfortable, sporty, smooth-riding, and quite fun to drive! Here I am, estatic to be on the road headed to places I had never seen before! Continuing along the scenic byway, the road continued to wind along the coast, allowing for a view of the water nearly the entire drive. We shortly reached the quiet town of Carrabelle, which was a pretty little coastal town, reminding me a little of New England beach towns, with several homes along the water and some wooded areas. Driving along for a few more hours, passing through what seemed to be an older more industrial town, Apalachicola, we continued onward. Eventually we reached a beach town that seemed to be much more touristy, Mexico Beach, with people walking along the street, hotels, restaurants, and even a little bar with live music. 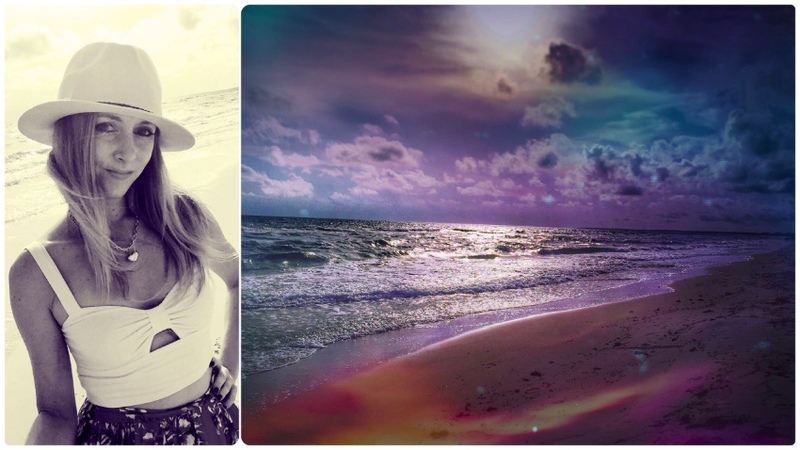 Finding an area with beach parking and a path onto the beach, I stopped, taking up the opportunity to put my feet in the Gulf, smell the salt in the air, feel the ocean breeze, and listening to the waves crash for just a few quiet minutes. At this point, it was nearly 7pm already, and we still had several hours to go on our drive to Mobile. Looking back, I should have booked a night along the coast to break up the drive, and Mexico Beach would have been a perfect little area. It seemed to have a lot of character, and I would have liked to explore more... I realized I should limit my stops and forge ahead to Mobile. The drive was quiet, until we went through Destin. We hit some traffic and drove by many large colorfully lit restaurants, resorts, and bars. This would have been another great place to stay. The tourist traffic slowed us down a bit, and eventually we left the main strip of restaurants, and drove into the Fort Walton beach area, on a strip of road with the Gulf on both sides. The sun was going down, and alongside the road was a sandy area with tire tracks and what seemed like a perfect opportunity for a photo of the water with the last traces of the sun. It was here that I had a Tania moment; when I see what could be a spectacular photo, I just have to try to get that perfect shot... Well, I couldn't resist driving off the road into the sandy area, despite my mother telling me there were "no driving" signs... A few seconds later, I felt the car drop off the pavement and sink into the sand, which was much softer than I expected, the turning wheels digging deeper and deeper. Freaking out, I put the car in neutral, reverse, drive again, and tried accelerating... Nothing. At one point I got out and found a rock and tried shoveling some sand out from underneath the tires... Still nothing. We were stuck. Frustrated and upset, I was beginning to accept that we were never going to get to Mobile. Day 1 of the road trip, and to my embarrassment, I had gotten the car stuck in sand dunes. My mother, who at this point had lost whatever traces of patience remained, angrily stepped to the side of the road and began trying to wave cars down to help us. After a few minutes, as car after car went by and no one stopped, I was about to the call the police, expecting to wait hours until we could get out of the sand. Miraculously, a large pickup truck pulled over with an enormous Confederate flag dangling off the back, and a young guy stepped out to examine the situation. In a Southern drawl, he said he worked as a landscaper, and drives up and down this road often, and he would be able to help pull us out of our mess. He said people get stuck often, and there is no way of driving out, that's why the signs were there, that I had regretfully ignored. He indicated the soft sand was just as bad as getting stuck in the snow up north... Calmly, after digging with a snow shovel and even laying in the sand to work, he placed a rope around my back tire, and as I steered the car in neutral, he slowly towed it backwards out of sand and back onto the road with his truck. 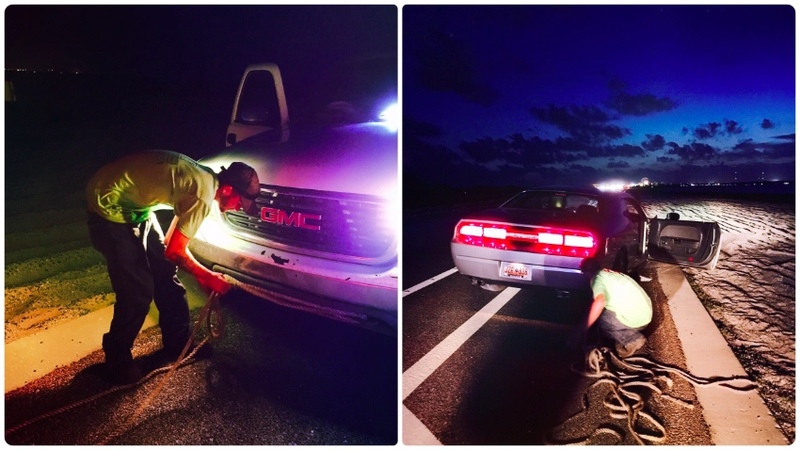 He said it was simply Southern hospitality and to never call a tow truck, to simply ask a Southern boy to help! We gave this gentleman $40 and thanked him repeatedly for saving our day. The car was running fine with not even a scratch, and, only 20 minutes later, we would make it to the hotel after all. I really cannot thank this guy enough for coming to our rescue, and he gave me his business card, so I would like to promote his lawn service on here. If anyone is in the Fort Walton Beach area, please consider using T-N-T Lawn Service, as he certainly showed us what Southern hospitality is all about. 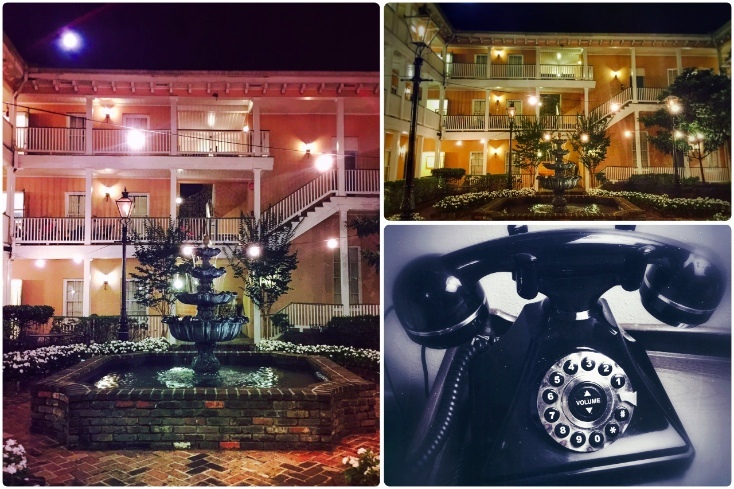 We continued on our journey, surprised by a view of early Fourth of July fireworks shooting into the sky as we drove through Pensacola, and finally, after an exhausting day on the road, at about 11pm, we settled into our historic boutique hotel in downtown Mobile, Alabama, the Malaga Inn. 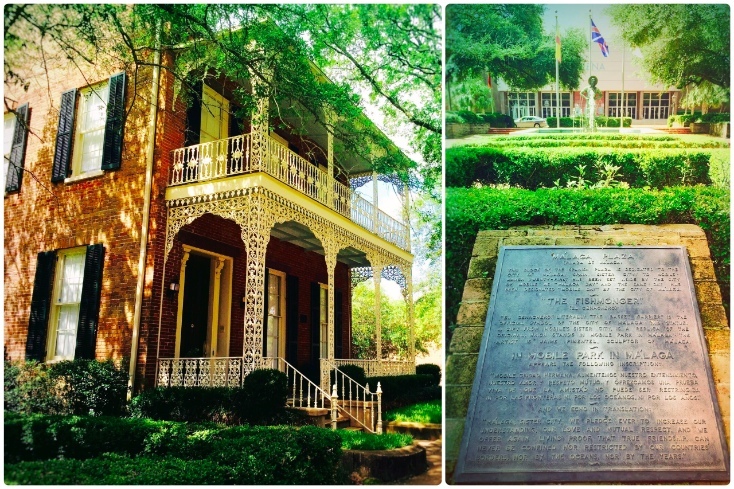 The inn was originally two twin townhouses built in 1862, during the war, by two brothers-in-law. Parts of the inn include an old carriage house which now contains a dining area and a bar, a beautiful courtyard, and even tunnels under the West house, believed to be a hiding place for Confederate soldiers during the Civil War. 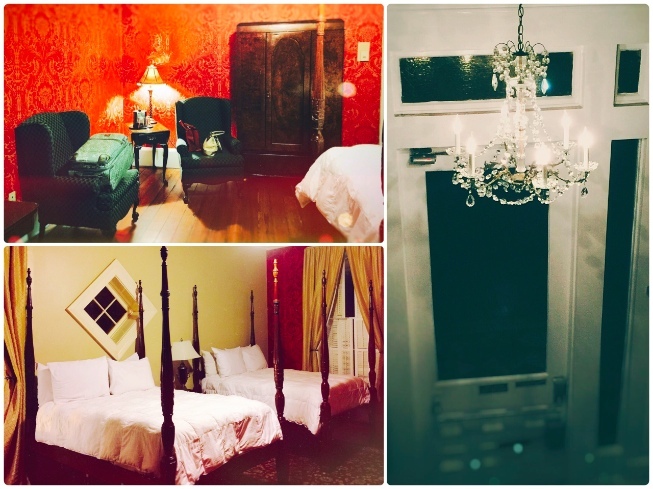 We had a historic room with two high twin beds. When entering the room, it was like stepping back in time. It had all antique furnishings, creaky wooden floors, and was slightly eerie with a musty smell, yet incredibly unique in its own way, despite having a slightly haunted ominance. 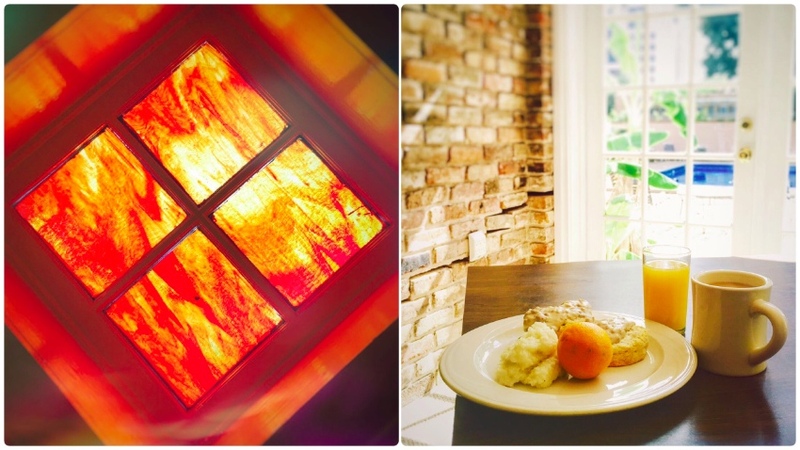 The room had beautiful diamond-shaped orange stained glass windows. The halls were dark, with giant wooden door frames, and decorated with dimly lit chandeliers. Since we missed our dinner reservations, we decided to take our picnic remnants, wine, cheese, cheddar bread, and smoked salmon, down to the courtyard for quiet moonlight dining after a very long day. It was still warm and humid outside, but the courtyard was beautifully lit by the glow of the moon shining amongst scattered clouds and the orange flickering flames housed in timeless lanterns. It was amazing and slightly mind-blowing to think of people sitting there under the same moon, with their horse-drawn carriages, nearly 2 centuries ago. The next morning, sunlight streamed in the stained glass windows, casting an array of orange to almost burgundy colors across the room. We headed down across the courtyard to the old carriage house for complimentary breakfast. I had never had biscuits with sausage gravy or grits before moving down to Florida, and I will say it is an acquired taste, but if made well, both have the potential to be delicious. I passed up the bagels and waffles; considering I was in Alabama, I opted for the traditional Southern breakfast. After breakfast, we headed outside to explore a tiny bit of the neighborhood before having to depart for Mississippi. 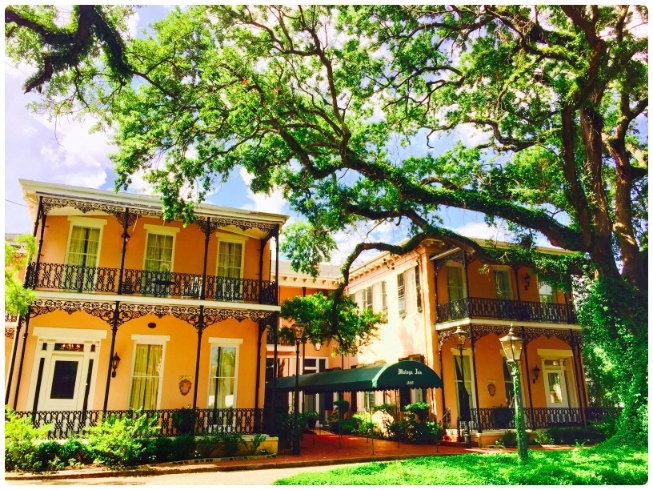 The inn proved to be absolutely stunning in morning light, with its distinctive Southern charm. "Málaga, sister city, we pledge ever to increase our understanding, our love and mutual respect, and we offer again living proof that true friendship can never be confined nor restricted by our countries' borders, nor by the oceans, nor by the years." Prior to visiting Mobile and stumbling across this fountain, I was completely unaware of the city's ties to Spain. One of the joys of this trip was exploring new terrain and finding little pieces of history I never expected to see or learn about. With that, we departed Mobile to head to our next destination, Mississippi, en route to Tennessee (my favorite segment of the trip), which I will document in my next blog post. Still so many photos to share and so much to write about... Stay tuned!